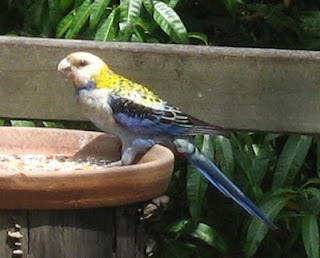 It's about time I posted some photos of the birds that visit us regularly. I expected I'd have an abundance of photos to choose from, but in fact I didn't find that many really good photos in my bird file. Nevertheless, I'll use what photos I have on hand. And as I get better ones of any of these birds, I'll update this post. Maybe this will motivate me to work a bit harder at capturing better shots of some of these elusive but spectacular visitors. Probably our most regular guests at the two bird feeders are small flocks of rainbow lorikeets. These birds are more plentiful at times when food is less abundant in the bush. I don't feed them a large amount of seed unless times are tough for them. But I have planted grevilleas and banksias near the bird feeders, and the flowers of those bushes are an even bigger attraction to the parrots than any birdseed I put out. Slightly more exotic (at least to interstate visitors) is the pair of king parrots – Mr King (below) with his electric red head and breast positively glowing in sunlight, and Mrs King, a bit less flamboyant, perhaps, but in better light you would see that her green plumage is tinged here and there with touches of turquoise. They are a shy twosome, rarely allowing me to get near enough to take a good photo. And though they almost always visit as a pair, often one will sit in a nearby tree or bush, or on the back of a chair (as at right), while waiting for the other to feed. Just as lovely as their showier cousins are the delicately toned pink and grey galahs. We don't get them too often, and it's probably just as well because they can get through a plate of birdseed pretty quickly. Large flocks are a menace to farmers, of course. 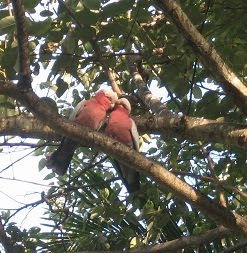 But it's hard to think ill of anything as pretty as a pair of cooing galahs. Speaking of menacing feeders leads quite naturally to thoughts of cockatoos. 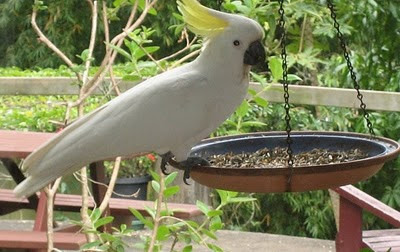 We have both the sulphur-crested white and the yellow-tailed black cockatoos at our place, though I've only seen the black ones down by the dam and never had a camera handy at the time. More common are the white fellows. They usually feed high up in my African tulip tree, whose giant seed pods they rip open and then drop from a great height. And every year they devour most of nuts on my pecan tree before I get any. But now and then one or two birds – sometimes five or six – will come down and raid the birdfeeders. Lucky they aren't aggressive. That big beak could do a lot of damage. The last parrot I should mention is the dear little pale-headed parrot, an extremely timid visitor who comes alone or sometimes with a mate. Everything about him is delicate – colour, song and eating habits. A family of frogmouths often used to spend the day sleeping in one of our trees. The bird gets its name, I guess, because when he opens that huge mouth, supposedly to frighten predators, he does look very much like a frog. But usually, he just sleeps the day away, posing successfully as a dead branch. 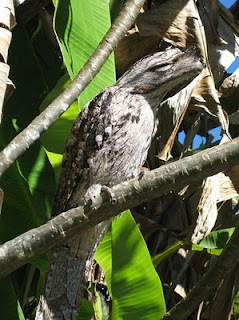 It's months since we've seen a frogmouth in any of what used to be their favourite trees. But we have seen a few dead ones on nearby roads. Unfortunately their habit of eluding predators by keeping still isn't much use in the face of oncoming cars. The butcherbird is so called because of his eating habits and diet. Finding himself with a surplus of 'meat' (such as large insects or even small snakes), he will 'hang' the leftovers in a V-shaped fork of two branches, or on some protruding piece of branch or stem, ready for his next meal. 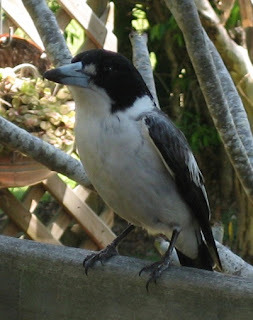 I once saw one of 'our' butcherbirds use that lethal beak to dislodge a little micro bat from a snug spot up behind one of our porch rafters, where the bat was sleeping away the day. The bird then chased the disoriented bat around the verandah for a few minutes, finally 'catching' him and flying off somewhere to enjoy this treat. Prior to this I didn't even realise these tiny bats were living up there. I can't talk about birdsong without mentioning the inimitable eastern whipbird. 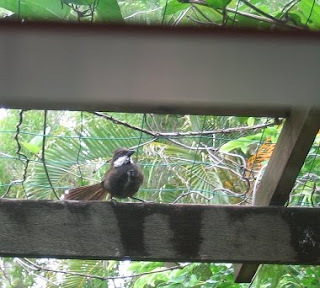 We are lucky to have at least one pair of whipbirds who visit us regularly – especially after lots of rain, when they patrol the well-protected banks above and below our house several times a day. There, close plantings of various shrubs and small trees offer the protection these birds like to hunt in. But other than sticking to these shady enclaves, they are remarkably unconcerned about us coming near. The difficulty in photographing whipbirds is that they rarely stay still for more than a few seconds. Travelling almost always in pairs, the showier male and his olive green partner bob around amongst the branches, often dropping suddenly to the ground to stir up dead leaves and mulch in search of the insects they favor. I have also seen one pair feeding on the little red berries of an asparagus fern, so they must be omnivores. They keep in touch while moving about via their hauntingly beautiful song, which is actually a duet. The first whiplike part is uttered by the male, and the two short notes at the end are the female's answer. There is also a little muttering chatter they make in between songs, which I find particularly attractive: "I'm right here", it says. "Are you still there, too?" 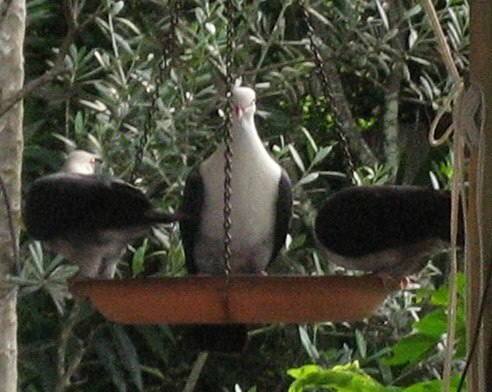 Another regular visitor is the large white-headed pigeon. 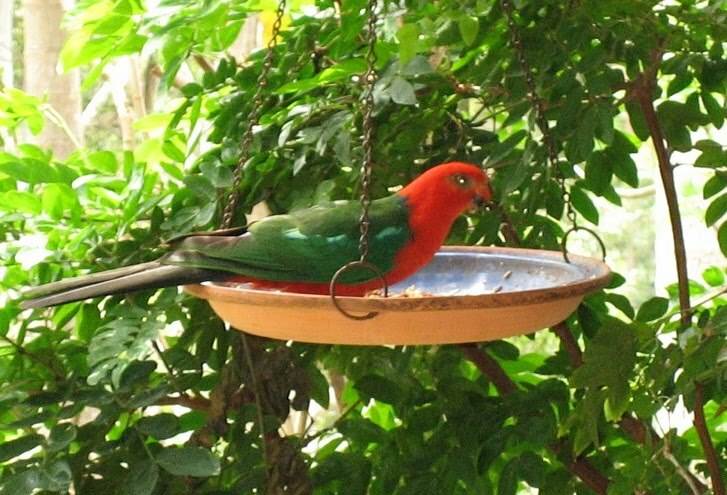 I sometimes worry about the chains that support this birdfeeder when several of these fat beauties land there at once. Their size may have made them a target for hunters in earllier times, but they don't seem to be bullies. 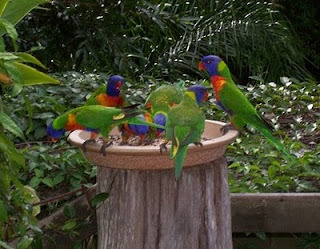 Often I see one or two of them waiting in overhead trees while the boisterious rainbow lorikeets eat their fill. And as soon as I approach with a camera, off they go, in a great flutter of their large wings. 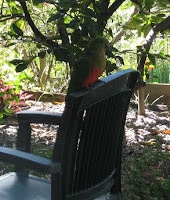 I wouldn't be sad if this next visitor turned his back and abandoned our garden for good. He's the native turkey, and I'm sure he has a role to play in the Australian bush. But he's not very welcome in most backyards and gardens – even those based on native plants. And you can't see it here, but he has great big feet that can rake up a cubic metre of mulch in one afternoon, or tip over and break a big ceramic feeder. Once you've allowed a male turkey to build his massive nest in your yard, as we have, the measures you'll have to adopt to discourage him from coming back to the same place every year are all illegal. 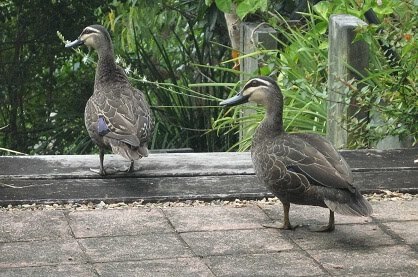 Equally messy visitors, but somehow more acceptable, are little pairs of wood duck that adopt our back verandah every now and then for a week or two at a time. One year a pair built a nest under a bush alongside the swimming pool, but something, probably a monitor lizard, got the eggs. I try not to encourage the ducks because their bathroom manners are atrocious. But while she lived with us for a year, Mum was very fond of them. 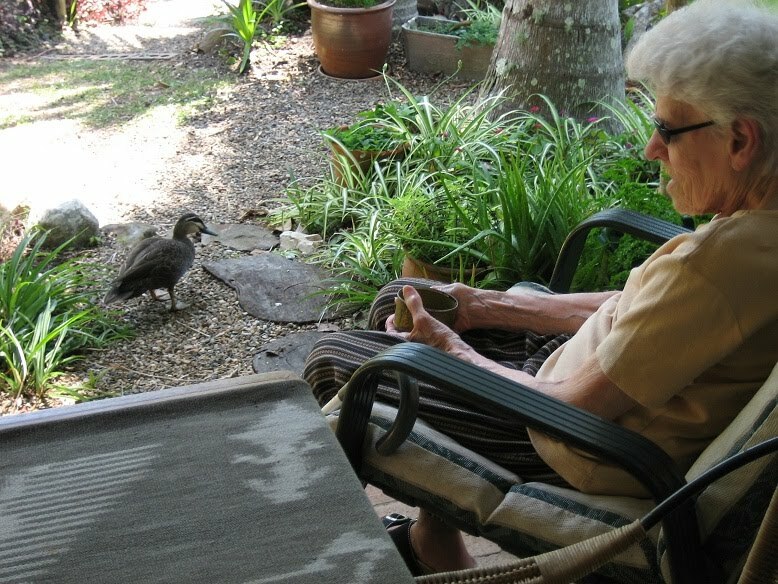 She would sit out every day with her little pot of grain, waiting for them to call by for a snack. I think they still come looking for her. So nice to get comments from two of my favourite 'birds'. Stafford Ray: An elderly neighbour always calls the white headed pigeon the 'native pigeon', but of course there are about 22 native Australian pigeons and doves, and this is just one of them. My favourite is the ground-feeding emerald dove, but though we've seen it half a dozen times over the years, I've never managed a photo. I didn't know that about the Butcher Bird! 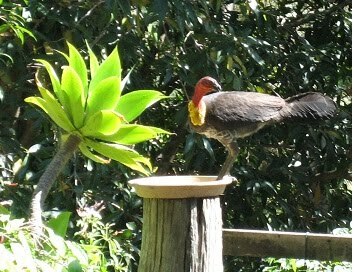 Thanks for all the pictures - I love birds (though the brush turkey can take a hike). Gabrielle, I saw a TV program that described the attempts by otherwise peace-loving Buddhist residents in the hinterland to deal with their menacing turkeys. It seems this bird brings out the worst in EVERYONE.